I was focused on the laptop, so I just thought the skirt was bright and pretty and then… arrrgh! 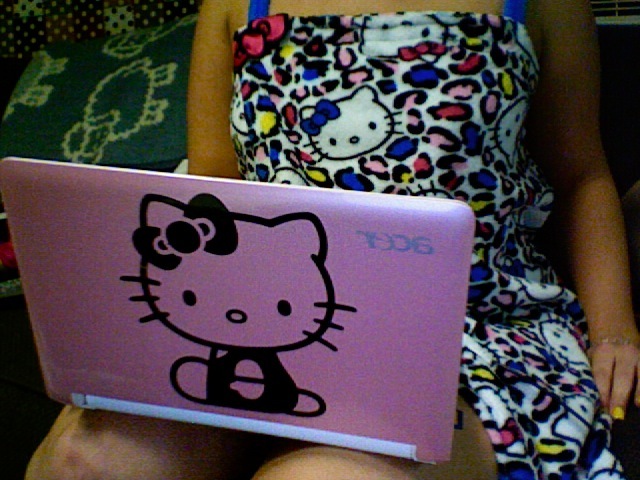 I use my Hello Kitty laptop to watch your demise Mr HKH. LMAO… I open up this picture link to see a wonderful Hello Kitty laptop and I am wearing the exact same wrap the girl in the picture is wearing. I owe that robe lol. I WANT IT SOOOOOOOOOOOOO BAD! OMFG!! WHERE DUH YUH QET DEH HK LAPTOP..??? where did you buy that pink laptop?my daughter would love it .